Whether you are a pro looking for some extra practice time or an amateur dabbling on the weekend, golf is a great sport for all seasons. However, maintaining real turf to the necessary standard for a quality round can be a challenge, especially in the UK when the weather is often less than desirable! So, instead of battling the elements and struggling to get a decent green in time for golf season every year, why not opt for an artificial putting green you can enjoy all year round? As well as being resistant to almost all forms of weather, artificial putting greens are significantly more durable than their natural alternative. This strength comes from the memory fibre pile utilised in our artificial grass products, creating a woven synthetic turf that bounces back when stepped on and resists all manner of environmental and physical pressures. Furthermore, artificial putting greens require much less maintenance than natural ones, giving you even more time to play the game. These benefits are a particular advantage when you consider the extra wear and tear a putting green endures from your clubs and feet. From an aesthetic perspective, artificial putting greens offer you the perfect lawn all year round, and thanks to their exceptional durability and unique drainage system, avid golfers won’t be faced with spring quagmires and balding muddy patches – leaving you free to return to the course quickly, even after heavy rainfall. An added benefit of artificial putting greens is that they stay pristine while remaining cost-effective. Unlike real grass, which needs ongoing care and maintenance, an artificial green will require much less maintenance while lasting longer. Synthetic lawns are not overly sensitive to temperature changes, they do not need constant hydration or trimming, and they aren’t subject to the same injury that golf spikes inflict on a real lawn. Of course, artificial putting greens do require basic upkeep on a fairly regular basis, but this is largely limited to little more than occasional brushing to remove dirt and debris. By staying on top of this comparatively minimal upkeep, you can keep your artificial lawn in top condition. 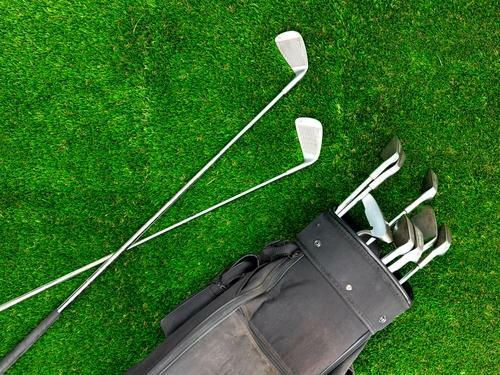 It's no secret that grass contributes heavily to a player’s performance, so maintaining an appropriate, high-quality playing surface is essential for an enjoyable golfing experience. As such, our artificial grass range is varied and adaptable, featuring multiple different products, each with their own unique features and characteristics. This enables you to choose the ideal match according to your exact needs and specifications – be it a multipurpose lawn fit for golfing and everyday activities, or purpose-built golf teeing turf. As well as busy public greens, artificial grass is ideal for private putting greens, too. Our expert team is experienced in quality installations of all kinds, from large commercial premises to smaller private ones. So, whatever your plans, the Artificial Lawn Company has got it covered. Boasting over 15 years' experience developing, supplying and installing artificial grass for a vast range of different purposes, the Artificial Lawn Company is perfectly placed to provide you with a comprehensive artificial putting green solution. If you are interested in learning more about our range or if you have any questions about purchasing the right artificial grass for your putting green, please browse our site for more information or get in touch with our team. From offering guidance on your lawn choice to providing quality installation, we are always happy to help.